Please note: this event is fully booked! An artwork entitled ‘Ruins of a Temple’, only recently confirmed as a piece by Venetian artist Canaletto (1695-1798), is now on display at The Sir Duncan Rice Library Gallery in a new exhibition. 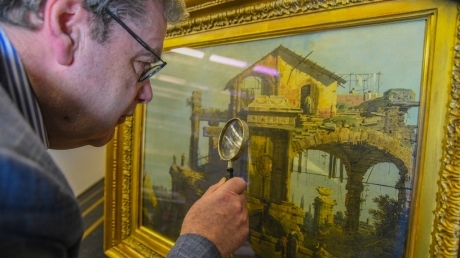 The painting has been held in the University’s collections since 1865 and was often thought to be from the school of Canaletto, but it was not until 2018 that it was confirmed to be an original by the Venetian artist himself. In honour of this rare find, Alumni Relations & The Development Trust, in partnership with Museums & Special Collections, are hosting a reception to view this wonderful piece of art. The reception will be held on Wednesday 13 February 2019. Guests can arrive anytime from 5.30pm, with the event beginning at 6pm with Mr Neil Curtis, Head of Museums & Special Collections, introducing the exhibition. Please feel free to book additional places for your friends and family. For info please email alumni@abdn.ac.uk.